Yeh! First to comment. On the ball, as usual. I forgive Jesus, Mo, and Moses “unreservedly”. They’ve earned that by being dead. Their still-living followers still have a lot to prove. @Ian Garrett…..yeah but you didn’t…….come to think of it…….3rd in anyway. Tim Farron hasn’t appologised for ‘appologising wrongly’ yet on his homophobic views so no redemption for him. Where occasionally some one would look. Written by some illiterate schnook. All those tweets were from last week, possibly even the week before. He was a different person then, we have to recognize the stable genius he is now, despite the negative press covfefe. 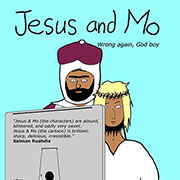 Actually, a Hitler and Mo duo would be much more accurate. You could probably get some mileage out of a Jesus, Krishna and Buddha trio, but then you’d have less time to conflate Christianity and Islam. @Free Speech…..Hitler was a Catholic so you would be conflating Christianity with MO’s Islam anyway. The three Abrahamic religions all worship the same Jewish war God, although Christians attempt to differentiate themselves by adding in an additonal reincarnating human for good measure so when it suits them they can distance themselves from the nastier bits of the Old Testament. If Jesus is God, then who, or what, is Jesus’s God? My apologies if someone has already answered this. @ Vanity Unfair ……. I think that Christians believe Jesus (1) to be God (2) as his son in human form through insemination of the Virgin via the Holy Ghost (3) whatever that is. This forms the Trinity (1+2+3) which they claim to be one unified thing they call God. Its even more confusing BS than the Jews or Muslims come up with. Jews perceive Jesus (if they bother) as just a man and his worship idolatry, whist Muslims have a more benign view of him as one of their prophets. PrimalVirtue: “a more benign view of him as one of their prophets” Nothing benign there: they consider “Isa” (their name for Jesus) to be the major MUSLIM prophet, who had never claimed for himself to be a son of God, and Muslims who fought for Allah will go to Heaven and others to hell: specifically Christians (who err by believing Jesus is a God or his son) and Jews (on who is the God’s wrath) (see the traditional interpretations of Quran 1:7, the verses that the Muslims are supposed to repeat many times per day!) are “the worst of creatures” (see Quran 98:6). @primal virtue. I only wish Muslims had a more benign view of anybody who dares to question their crock of shite religion. Even supposed tolerant Muslims would agree to kill anybody who disrespected the Koran.